On June 26th, the tenth graduation ceremony of "1 +2 +1 Sino-US personnel training program" was held at Jinan University. The graduation ceremony included four of our students, Huan Xiao Jiang, Zhao Meng, Suya Jing and Tang Hao who successfully completed the full two-year program. Dr. Zhang of our university, Troy University's Vice Chancellor Jack Hawkins and the Director of the International Center of Hawaii Hilo State University issued the Sino-US joint Todd diploma and degree certificate to them. In addition, Jiang Huan Xiao who was studying in the United States received an honour with a GPA of 3.8. The Chinese Association selected him for the honorary title of “2013 Outstanding Graduate” for International Education, the International Education Exchange Center and the American Association of State Colleges and Universities. Jiang Xiao Huan a student of Georgia State University studying for postgraduate qualifications in human resources continued to pursue a master's degree in the United States from September. Principals and project members used the opportunity to meet American colleges and universities. American Universities Cooperation Conference, the English Course Description Database building workshops and American Universities' Presidents had forums and a series of meetings, exchanges and cooperation with other participants, to discuss how to further deepen and expand the project development. "1 +2 +1 Sino-US personnel training plan" is the Ministry of Education China, Education Association for International Exchange (CEAIE), the International Center for Education (CCIEE), American Society (AASCU) and the State University College in collaboration with the management of new SINO-US exchanges and cooperation in higher education projects. CCIEE and AASCU select Chinese and American public higher education as a conditional member unit of the scheme. 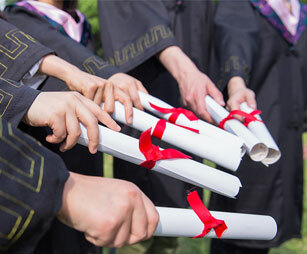 Specific commitment to teaching tasks are made on the basis of mutual recognition of the two sides on college credits and direct selection of first-year undergraduate students from Chinese universities to participate in the program. Five students studying in the U.S. with two teachers from the college's School of Foreign Languages went to the University of East Washington and Georgia State University for further study of the project.